If you fly frequently on business, our business air travel tips help you to make your flight as comfortable and enjoyable as possible. Most business people travel on tight schedule. Many go straight from the airport to the office or into important meetings. It is therefore crucial for business travelers to arrive at their destination as rested as possible. Better business travel positively affects their productivity, as well as their personal wellbeing. Many things can affect your comfort when flying on business, both before and during your flight. These practical business air travel tips will help you to feel more comfortable when flying on business and to arrive better rested at your destination, regardless of which class you are flying. When choosing which airlines to fly with not only compare the prices, also compare the service and level of comfort involved. Legroom is for example important factor that can seriously affect your comfort during the flight. When flying on business avoid flight connections if you possibly can. The risk of disruption to your travel plans increases drastically every time you have to catch a connection flight. If you possibly can, do not book the last flight home. If your flight is delayed or cancelled, you might have no other options than to stay overnight… and if you are like most of us, then you cannot wait to get home after your business trip. Check-in online, it saves you time and allows you to choose your seat earlier in the check-in process. If you are on a short trip, then you can usually check-in for both the outbound and inbound flight before departing. Bear in mind that not all airline seats are the same. 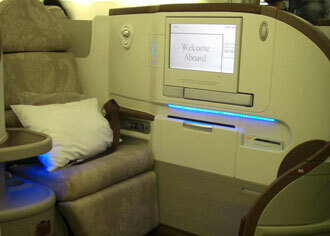 We help you to Choose The Best Airline Seat for your journey. If you need to embark quickly, then you might want to select aisle seat close to the exit. Arrive timely at the airport. It may be tempting to arrive at the last minute but stricter security measures at all airports mean it takes longer to get through security and you might risking missing your flight. What You Wear When Flying can really affect how comfortable you will feel during your flight. How you dress can also affect how quickly you get through security so when flying on business dress for security. Keep your belt, watch, wallet, and change in your carry-on luggage until after you have passed through security. Wear shoes that are easy to take off and slip back on. 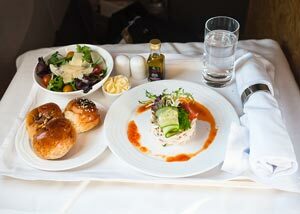 Take care of what you eat and drink during your flight. If you need to arrive fresh and prepared eat light meals and avoid alcohol, tea, and coffee. This is also helpful in fighting jet lag. Long-haul flights are demanding on the body and soul. Make sure you drink plenty of water to avoid dehydration, since airplanes have very dry air. Do in-flight exercises, like walk up and down the aisle or circle your ankles and stretch your arms while sitting in your seat. Jet lag is always bothersome and especially when travelling on business as you usually cannot allocate day or two to recover from it, as you might (and should) when travelling on leisure. Many of above business air travel tips will help you in your fight with jet lag but one of the most effective method to re-set your body clock is to change your watch to the local time of your destination as soon as you get on the plane. There are many products available that can make your business air travel more comfortable and allow you to arrive better rested at your destination. We have chosen our favorite In-Flight Comfort Products for your convenience. Most of them are very well suited for other mode of travels as well, e.g. on car and train journeys. If you have tried to sleep on a long-haul flight, you might be familiar with “the dry throat”. A simple trick helps with this annoying problem. Try pulling a blanket over your head when you are sleeping, it should stop your throat from drying out.